Hello dear friends: I have a card to share with you today I made for the Pals Paper Arts Sketch challenge, here is my card. This cute little Christmas critters are from a retired 2011-2012 Stampin Up! set called "Forest Festivities", I love using my old and much loved sets. I stamped them onto Canson water color paper with Stazon Jet Black ink and colored them with this SU markers and the aqua painter: Riding Hood Red, Tempting Turquoise, Old Olive, More Mustard, Chocolate Chip, Garden Green, Regal Rose, Bashful Blue. I added a bit of Dazzling Diamonds for the snow under the bunny's feet and sleigh. I can't remember where I got that background snowflake stamp but I used Coastal Cabana to stamp in onto a panel of Ninah Solar White card stock and to sponge each little square for a little definition. The sentiment is from the Power Poppy Merry Littles , one of many beautiful images on this set, and it's cut with a label die from Spellbinders, (I'm not to sure about this, I had this die set for a long time now). Here is the banner that inspired this card. Thank you so much for visiting, I appreciate all you comments, thank you!! Hello everyone: I'm here with a card to share with you for CAS(E) this Sketch! Challenge #150, here is my card. This little candles with their golden holders are from a Power Poppy stamp set called Merry Littles , this set has a whole bunch of sweet little images and this candles are one of them. I stamped the candles onto a panel of Canson water color paper using my MISTI to be able to position them exactly where I wanted them, then I colored them with the aqua painter and SU markers in Real Red, Garden Green, More Mustard, So Saffron and River Rock (for the candles). The mantel where they are standing was stamped with the SU Hardwood background stamp and then, I die cut it with Tim Holtz Alterations Die Window and Window Box , I made a couple of score lines to give it a bi of dimension. 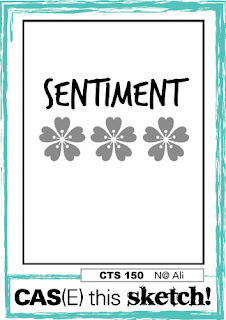 The sentiment was stamped with the retired SU "Curly Cute" stamp set, then heat embossed in gold. I sponged a bit of SU Hello Honey ink on the flames to give this candles a little glow. Here is the banner that inspired this card, I just changed the position of the sentiment placing it on the bottom. Thank you for stopping by, until next time, happy stamping. Hello everyone: I have a quick card I made for the "Less is More" one layer Christmas challenge with a theme of "SANTA", The Whimsy Stamps "Anything Goes Holidays", I love it when I can combine several challenges with one card so, I couldn't resist making another card with this super fun set from Katzelkraft called Les Furieux , if you are a cat lover, you know very well that cats are not fond of wearing anything but their fur, so putting a hat, a Halloween costume or even a sweater, could be dangerous to your health, LOL!! I made another card using this fun set, you can see it HERE , and this is my card for today. I stamped the cat first on the acrylic sheet from the Stamp-a-majig, then, I removed the cat stamp and placed the hat, stamp it onto the sheet to place it exactly where I wanted it. Once I had this images aligned perfectly, I stamped the hat onto the paper first, then using a little mask I made of the hat, I stamp the cat, so it seems to be wearing this Santa's hat ''happily''. I colored the hat with my red Prismacolor pencil then, I colored the kitty's eyes with Daffodil Delight and it's nose with a bit of Regal Rose. I was inspired by THIS card from Maaike Uijtoven I saw on the gallery at "Less is More", she used another stamp set from Katzelkraft called Les Chats russes , which I plan to get ASAP!!!!! Her post of her card along with some pictures of her cats is just hilarious, I hope you go check it out!! Thank you Maaike!!! So, there you have it, a simple card that I hope you enjoy. 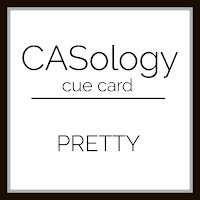 Hello everyone: I have a card to share with you today for the CASology week 173 challenge with the Cue Word "PRETTY" and the Addicted to Stamps and More! challenge #171 "Anything Goes" challenge, here is my card. I looked and looked for a stamp with the word "PRETTY" but I don't have one, I have words like Gorgeous, Beautiful, Amazing, Fabulous, Sweet, etc. but not PRETTY so, I grabbed this stamp from a gorgeous but sadly retired Stampin Up! set called "Eastern Influences" with the word Beautiful in Japanese, which I heat embossed in gold. I thought it would go very well with this image from Kraftin Kimmie called "Katara", unfortunately I think it's retired because I couldn't find it at their store. I stamped the image onto a panel of Canson water color paper with Stazon Jet Black ink and colored with SU Blackberry Bliss for the dress, which also has a bit of gold gel pen. The little Dragon's body was colored with this Neon Green paint that I had for years, it's wings and fuss on his head with a bit of SU Perfect Plum marker and a bit of Wink of Stella shimmer. In this photo you can appreciate the gold embossed Japanese word "Beautiful". I tried to keep my images on the bottom 1/3 of the panel, I might have gone a bit higher this time, I hope it's ok for the CASology requests for CAS cards. I hope you like my interpretation of PRETTY, I think the way this sweet girl is looking at this adorable little Dragon fits the Cue Card. I want to thank you for stopping by, until next time, happy stamping. 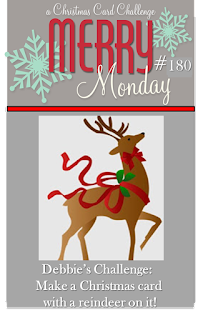 Hello everyone: Today I'm once again, combining two wonderful and fun challenges, Merry Monday with a theme of "Reindeer" and Mojo Monday with another fabulous sketch. I like to be able to combine challenges and I did have to dig into my stamp sets to look for a Reindeer, only to find this gorgeous one (well, I think he can qualify as one, without the silver and gold bells), what do you think? This image is from a retired Flourishes stamp set called "Mountain View", I love the majestic look of this buck, I figured he is just enjoying the beautiful surroundings, getting strong for when Santa comes to call him for duty, I think this is Dasher. I stamped Dasher onto a Canson water paper circle die cut and colored him with my aqua painter and this SU markers: Soft Suede, Chocolate Chip for his body and rack, Garden Green, Old Olive and Basic Gray for the landscape. I sponged a bit of Tim Holtz Broken China for the sky and a bit of Baked Brown Sugar around the circle to give it a bit of definition. The background panel is from the SU Winter Wonderland Designer Vellum Paper Stack , which has the most gorgeous images for the Holidays, this one fits perfectly for my card. I stamped a panel of light brown card stock with SU Hardwood background stamp with Baked Brown Sugar ink, I cut a couple of pieces for the banners on top. The sentiment is from my stash of retired Flourishes sentiments. Here is the banners that inspired this card. Hello everyone: I have a card to share with you for the "Less is More" one layer challenge with a theme of "Santa" and the LiveLoveCards November Challenge with a theme of "Snowflakes". I think this card could qualify for this challenge since there are a bunch of Snowflakes on the roof top and the chimney, don't you think?, here is my card. This images are both from a retired Flourishes set called "Joy is in the Air", the set has the image of a snow globe plus the Santa 2 more equally cute images, this is like a 2 step stamp set, you stamp the snow globe and then, stamp the image inside. Since this challenge calls for a one layer card I cut an 4"x11" card base from Ninah Solar White card stock and folded it at 5 1/2 then, stamped the images with Memento Tuxedo Black ink. I colored them with my Prismacolor pencils. I heat embossed the sentiment with gold EP, added a little SU Dazzling Diamonds to Santa's hat and the snow for some sparkle and added a couple of score lines to either side for a bit of texture. Now, I colored Santa's mittens last, I honestly did't know if they should be white, black or red, I actually Google this question and I got several responses for the colors, mostly favored red mittens so I colored them red. Now, some mentioned Santa's toy sack and said that it could be either red, green or blue so, I chose red. It's amazing the stuff you find out just by Google-ing!! I want to thank you for stopping by, I appreciate your comments and will answer your questions, should you have any.